Your mission: as you fly through space, shoot and destroy as many asteroids, and the occasional flying saucer, as possible while keeping your ship from being hit. Now, watch out! 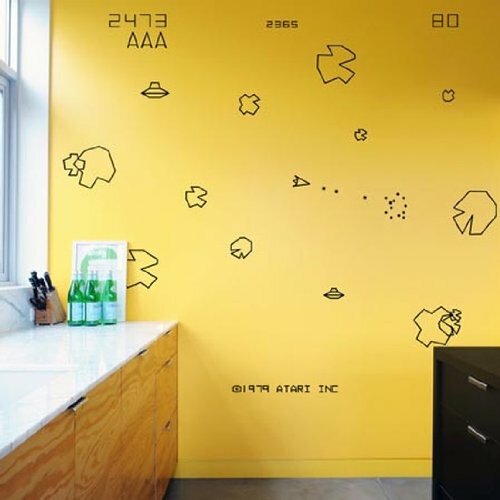 Made with blik Re-Stik, these movable and reusable decals are based on the same 8-bit graphics from the original Asteroids arcade game. This is an official Atari licensed product.65 movable decals per package 21 various sized asteroids (4″ to 20″) printed on clear 21 various sized numbers printed on clear 21 various sized gameplay graphics printed on clear 2 26″ x 4″ aracade console graphics.